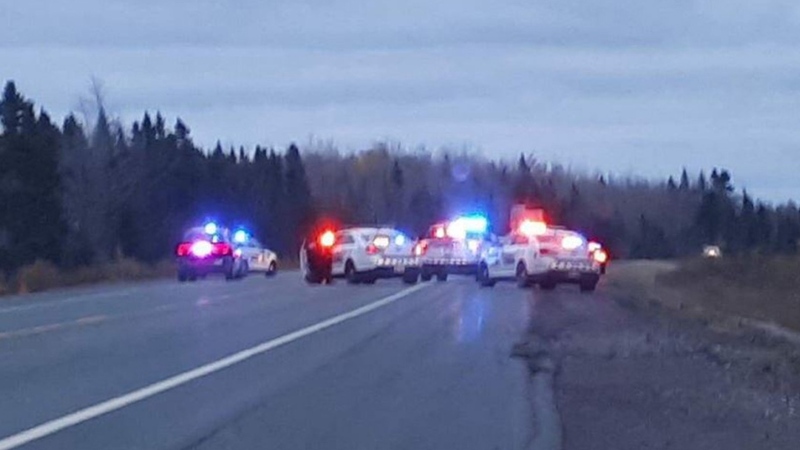 A man is dead following a bizarre incident in which a shot was fired inside a store in Miramichi and later inside a vehicle following a high-speed police chase. Members of the Miramichi Police Force responded to the Walmart on Douglastown Boulevard around 5:10 p.m. Wednesday. Police say a 26-year-old man had discharged a firearm inside the store before officers arrived to investigate what they called an “active shooter” incident. “While responding, the officers were notified that there were shots fired," said Randy Hansen, a superintendent with the Miramichi Police Force. Police said no one was injured inside the store and by the time they arrived, the suspect had fled the scene in a vehicle. Officers pursued the vehicle south on Route 11 but police say the driver refused to stop. The Miramichi Police Force called on the Richibucto RCMP for assistance around 5:30 p.m.
“On Route 11, near Richibucto, RCMP deployed a spike belt and the vehicle did come to a stop,” said New Brunswick RCMP spokeswoman Cpl. Jullie Rogers-Marsh. Wednesday evening, the Miramichi Police Force said the vehicle’s occupants had been taken into custody but the RCMP revealed additional details Thursday. The Mounties say officers heard a shot fired inside the vehicle shortly after it came to a stop. The 26-year-old driver was injured and taken to hospital, where he later died as a result of his injuries. That woman is 41-year-old Wendy Gale Losier, who was a passenger in the vehicle. She was arrested at the scene by the Miramichi Police Force. Police say no shots were fired at police and no one else was injured. The incident has shaken up residents, who say they aren’t used to this type of violence. Losier appeared in court Thursday. She's facing at least three charges including: theft under $5,000, possession of a firearm, and possession of a firearm knowing the serial number had been removed. Losier made a commotion when she appeared in court, blaming RCMP for what she called her “friend’s” death. She'll appear in court for a bail hearing Friday at 9:30 a.m.
Police say the next step is to investigate the sudden death of the 26-year-old man. An autopsy will be conducted.